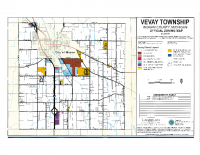 The Vevay Township Zoning Ordinance of 2008 is based upon the Vevay Township Master Plan and provides for the establishment of zoning districts and district uses, standards, and regulations designed to promote the public health, safety and general welfare. The Ordinance encourages the use of land in accordance with its character and adaptability and limits the improper use of land. It conserves natural resources and energy to meet the needs of the State’s citizens for food, fiber and other natural resources, places of residence, recreation, agriculture, industry, trade, service and other uses of land. The Ordinance insures that uses of land shall be situated in appropriate locations and relationships in order to avoid the overcrowding of population, ensure adequate light and air, lessen congestion on the public roads and streets and reduce hazards to life and property. The Ordinance also helps to facilitate the adequate provision of a system of transportation, sewage disposal, safe and adequate water supply, education, recreation and other public requirements and conserves the expenditure of funds for public improvements and services so as to obtain the most advantageous uses of land, resources and properties. The original Zoning Ordinance was adopted by Vevay Township in 1957. Between 1957 and 1972, the Ordinance was amended 14 times. In 1972, Vevay Township adopted Ordinance no. 7. This Ordinance was amended several times between 1972 and 1977. In 1977, the Ordinance was reprinted and amended again. This was followed by Ordinance no. 17, adopted in 1985. Ordinance 17 has been amended approximately 41 times between 1985 and the present. In 1998, the Vevay Township Planning Commission recognized the need to rewrite the Ordinance. It conflicted with the 1992 Master Plan. The Township hired Sunberg and Carlson of Marquette, Michigan. The Planner assigned to Vevay Township was Tim Dolehanty. Before completion of the Ordinance, Mr. Dolehanty left Sunberg and Carson and the Ordinance was never completed. In 2004, after the Master Plan was completed, LandPlan indicated that the Ordinance conflicted with the 1992 and 2004 Master Plans. In addition, the Township attorney, J.R. Robinson, advised the Township to rewrite the Ordinance. In 2005, The Vevay Township Planning Commission attempted to convert our township ordinances into an ordinance Vevay Township could use. The Williamston Township Ordinance was selected as their model. After approximately one year, the Planning Commission approached the Township Board and requested that a planner be hired to assist in writing the plan. LSL Planning from Grand Rapids was hired to complete the ordinance. The first public hearing was held in October 2007. Suggestions and comments were gathered and the draft ordinance was changed to reflect the concerns of the residents. Several amendments were made to the Zoning Ordinance after 2008 were compiled into an updated Zoning Ordinance in 2015.